Sun Jifa, is a 55-year-old farmer from Guanmashan, Jilin province, northern China, lost both his arms when a homemade bomb exploded prematurely. Jifa was working on explosives designed for blast fishing. (Blast fishing is the practice of using explosives to stun or kill schools of fish for easy collection.) The bomb blew up in his home leaving him with no arms. He was rushed to the hospital and treated, then his doctor told him that he will need prosthetic arms to replace his arms that were not possible to reattach. 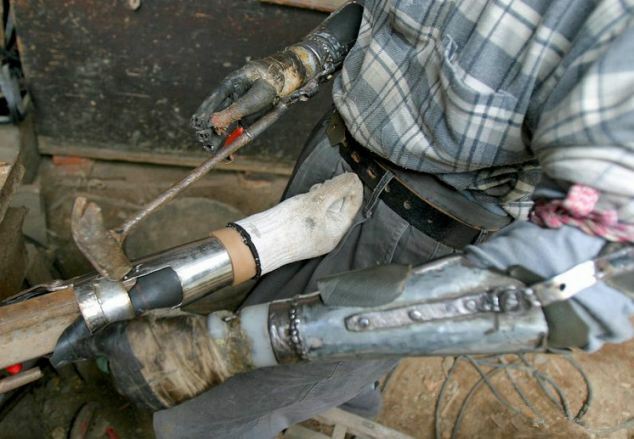 Jifa who was a farmer by trade could not afford the prosthetic arms, but he desperately needed arms in order to work on the farm and provide for his family. That’s when he decided to build his own artificial arms out of scrap metal. It took Jifa eight years of planning and several prototypes, to finally have a pair of functional arms. "I control them with movements from my elbows, I love to eat by myself, being a free man, and not having to depend on people for everything I need,” Jifa said. "The only drawback is that the steel is a bit heavy to wear, and the steel gets hot in the summer and cold in the winter," Jifa added.